It makes no difference whether you are a first timer or one of our many established customers. It's our way of evaluating the efficiency of our e-commerce site. Simply PRINT this page and turn it in to one of the rental professionals on your next visit. A quick call in advance, to the respective location, will reserve the equipment you want so that it will be available when you want it. *Coupon is one time use only! Offer applies to "full day" rentals only! 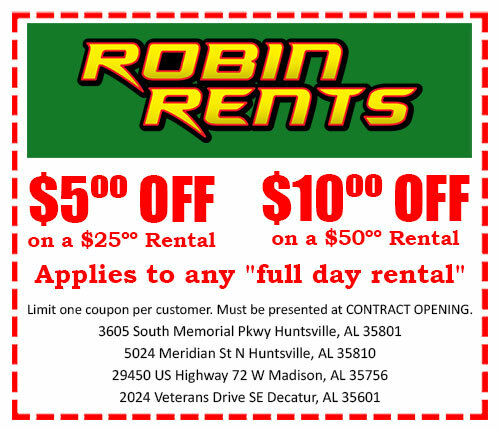 Print This Page - Receive a Complimentary Robin Rents Discount. Limit one coupon per customer and it must be presented at CONTRACT OPENING.